Performance Time: Approximately 60 minutes, 50 pgs. COMEDY. When the Baker ventures into a witch’s garden to fetch rutabagas for his wife, the wicked Witch of the Winds catches him and demands just one thing in exchange for the rutabagas?the Baker’s daughter, Gildersnort! 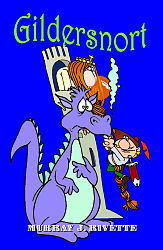 The witch imprisons Gildersnort in a tower guarded by a fierce dragon. But wait a minute! This dragon isn’t fierce! It turns out Daryl D. Dragon isn’t as scary-looking or fierce as the temp agency promised. In fact, he can’t even breathe fire because he drinks too much Pepto Bismol for his upset stomach. But just as everything looks rotten for Gildersnort, a prince, formerly known as Artist, arrives on the scene. Will he be able to remember the secret code and free Gildersnort from the tower?